These stylobates type stones did not support a column but were created to form a small platform for the Canopic Chests. 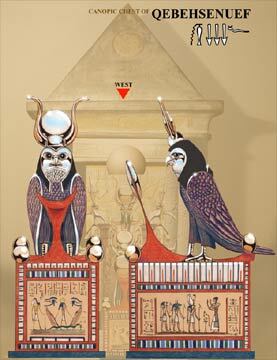 The four very ornate Canopic Chests represent the four sons of Horus. The chests are painted wooden rectangular boxes where the lids are exhibits of true craftsmanship. Atop of each lid is a full figure of each of the sons. The hawk, Baboon, Jackal and human figures are brightly coloured with in-layed silver and gold elements all in front of mirrors that not only reflect themselves, but also the magnificent Alter behind.